I’m a kid at heart, so naturally, I love doing writing prompts with my kids. It’s something we started with our education binders this summer and has become one of our favorite parts of the day. Each night, about a half hour before bed, I gather up the kids for an imagination exploration! They each have their own little notebooks and matching pens lovingly tethered to the spiral binding, and after their prompts are revealed: the excitement begins!! The scribbling of pens, stifled giggles, how they tap their fingers onto their little chins in thought, the far off gaze into the corner of the ceiling while their eyes dart around in their heads trying to think of just the right words to describe their amazing stories their minds are creating: you can just see the limits of their imaginations expanding and I absolutely love it. 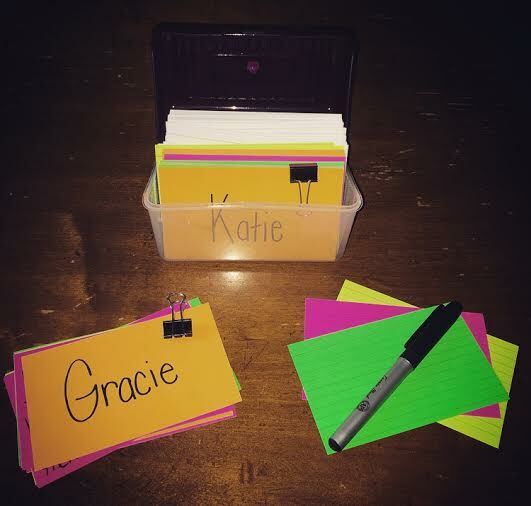 For my prompts, I have a little box of notecards with a section for each of the girls along with blank cards for when I happen to think of a new idea. Some I found online, some are my ideas, but all of them are totally fun. Honestly, can you think of a better way to put your little one’s mind into dream mode before bed? Last week at Parent/Teacher conferences for my third grader, her teacher asked me to share some of these ideas with her for the class. Instead of just typing them up and sending them to her, I thought I’d take the opportunity to write a blog to share them with everyone here! Would you want to visit the moon? Why or why not? What do you think it would be like? Imagine if you woke up and were TWENTY FEET TALL! Describe what life would be like. Write a short story about a family of squirrels who lose their home when their tree falls down after a storm. Describe one thing you are really good at! Now write an encouraging note to a child who can’t do it at all. You get a set of minions for an entire day: What would you do with them?! Think of the oldest person you know: describe them for a stranger, tell them everything you know. Write a short story about a polar bear who doesn’t like the cold in the arctic! If you could cook any meal for your family, what would you make? Tell me about how/what you would do for a full sit-down dinner. How old were you four years ago? Tell me some of the things you can do now that you couldn’t do then. Imagine seeing a dinosaur walking through the backyard! Write a short story about what you see and what you would do. Tell me about a time when you were really brave. Choose a family member: tell me everything you know about them! Write a story about a young monkey who loves to swing in the trees but one day, swings too far across the jungle and gets lost. What if our cat Snowball could talk?! What would he say? Tell me! You just won an all expense paid trip anywhere you want! Where would you go? Who would you bring? What would you do there? Tell me all about it! If you were forced to spend the rest of your life in a library, a zoo, or a museum; which would you pick and why? Would you rather go back in time or into the future? Why, what would you do? What are some things you wish you were able or allowed to do but can’t because of your age? Could you be President? Tell me the top 5 most important issues in the U.S. and what you would do to fix them. Write about an important lesson you learned in life. What kind of mom do you think you’ll be? What would you do differently if you were the mom and I was the kid?! How do you feel about Wednesdays? Tell me about it! My best summer trip ever was when we went to ________. Now write a brochure for the trip! Name one appliance in the home you just could not live without. Why not? What would you do without it? You’re stranded on a deserted island! Someone is with you – who do you hope it is and why? Tell me about your first day on the island. Make me scared of…. the Tooth Fairy!!!! What would you do to entertain your family… with NO money and NO electricity! Tell me about it. Who is your role model? What do you admire most about them? Describe what you think of as a ‘typical father’. Who is your best friend? What makes them ‘the best’? If you could make an imaginary report card, in what subjects would you get an “A” in? What is your favorite season? What do you like to do during that season? Tell me about it! Make me scared of… the Easter Bunny!!! Write a poem about our house/family in the style of Dr. Seuss. Tell me what makes someone truly beautiful! What advice would you give to a new student in your school? You’re locked inside the mall overnight! What would you do?! The electrical grid just went down for good! Tell me what we would have to do to survive. What was it like to spend your first night away from home? Build your dream home! Tell me everything you would do if you had authority to design it yourself. Were you ever in a fire, flood, tornado, or hurricane? Tell me about it. Write about moving to another city or neighborhood. You just won a $250,000 gift card that must be spent at the mall! What would you buy? Tell me about your shopping spree! Describe what you think of as a ‘typical mother’. Write about three things you have learned by being part of this family. Design an app that would change the lives of children everywhere. What would it do? Another great site kids can visit during screen time is Scholastic. They have fantastic Story Starters for PreK-6th graders and completing the prompts also helps kids with keyboarding skills as they use the computer to type out their stories. I also have more resources and ideas for kids on my Pinterest Education board, but I hope these writing prompts are enough to get you and your kiddos going on writing some amazing stories! Let me know which ones are your favorites and what you and your kids think, too. I hope your family has as much fun with them as ours does!